A firefighter works to put out hot spots on a fast-moving wind-driven wildfire in Orange, California, Oct. 9, 2017. Thursday's weather forecast for northern California calls for high winds and low humidity - conditions that make it close to impossible to contain the 22 major wildfires burning north of San Francisco. The fires are raging across nearly 69,000 hectares of several counties, world famous for vineyards and wineries. The flames have killed 21 people since Sunday with more than 500 reported as missing. But officials believe many of the missing have simply not checked in with friends and family yet. About 3,500 homes and businesses have been burned to their foundations. All that remains of some neighborhoods are a few blackened chimneys, charred trees and abandoned burned-out cars. Some people say they no longer recognize streets and surroundings they have seen every day for their entire lives. 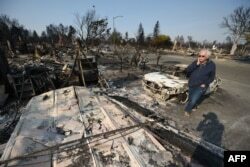 Homeowner Phil Rush reacts as he looks at the remains of his home destroyed by wildfire in Santa Rosa, Calif., Oct. 11, 2017. Rush said he and his wife and dog escaped with only some medication and a bag of dog food when flames overtook their entire neighborhood Oct. 9. California's forestry department fire chief, Ken Pimlott, calls it "a serious, critical, catastrophic event." He is helping oversee the 8,000 firefighters battling the flames. Pimlott is also pleading with people to be aware that even the tiniest spark can set off new fires in an instant. Authorities do not know the exact cause of the fires, but say anything from a car backfire to a thoughtlessly tossed cigarette can bring on an inferno. Strong dry winds called the Santa Ana winds blowing across the valleys from the mountains put northern California at an extremely high risk for wildfires in the late summer and early fall.